Kokoni Izakaya is the latest Toronto restaurant to jump on the popular Izakaya trend offering a variety of small, tapas-style specialty dishes that go well with beer and cocktails. Found in the heart of the Village , this restaurant serves lunch and dinner but also transforms into a dance club late in the evening. 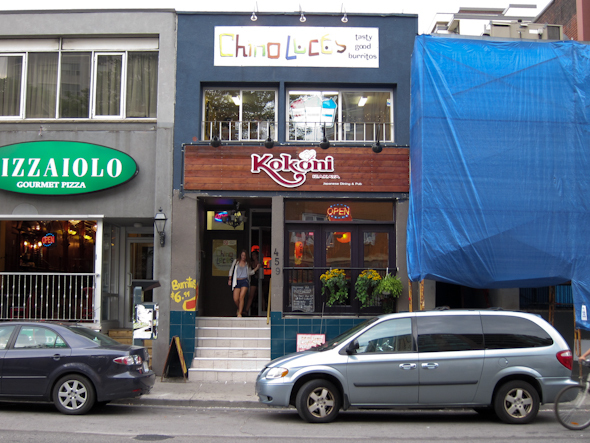 Open for about a month now, Kokoni Izakaya is run by a former instructor from the Ichiban Sushi school who also owned an izakaya restaurant in Korea. It's located below Chino Locos in one of the busiest blocks on Church and is quite easy to miss. 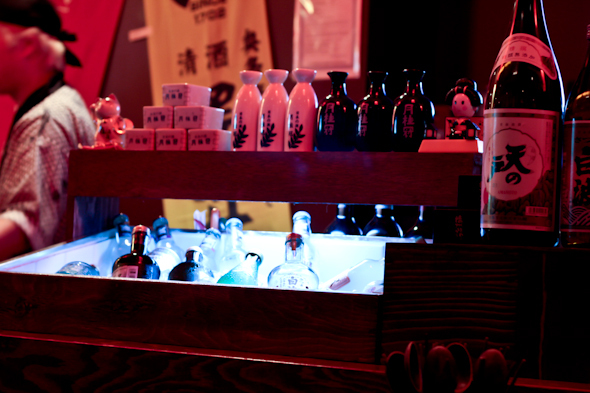 The interior features a long sushi bar as well as a collection of sake and sochu bottles of various sizes and designs. We begin with the house noodle soup with tempura flakes with green onion and nori (seaweed). This soup is a surprise that hits the right spot with its mild taste and is a good start for the rest of the meal. 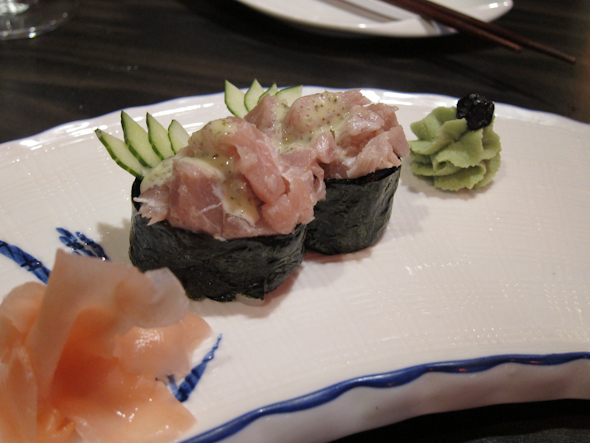 Gunkan ($4.99) is a battleship shaped sushi-roll with seaweed and chopped albacore with ginger and negi mayo. It sounds good on paper but what we get is two rolls packed with albacore bits and almost no flavour. Takoyaki ($4.99 - top photo) are deep fried octopus balls sprinkled with bonito flakes. These redeemed the kitchen and go well with our cold bottles of Sapporo. 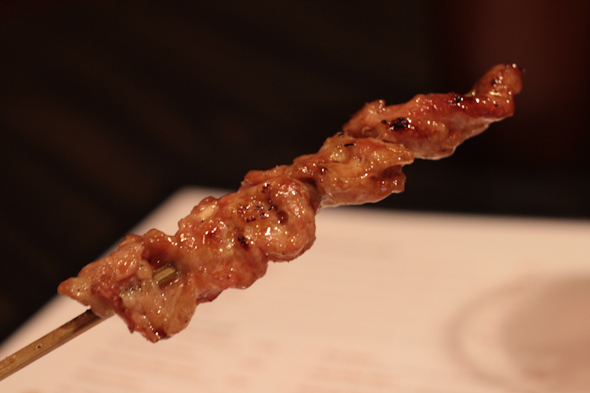 The Pork Belly Kushiyaki ($4.99) are delicious. They mix the salty goodness of grilled-just right meat with the sweet succulence of the Teriyaki sauce. The taste is not unlike grilled ham or bacon. 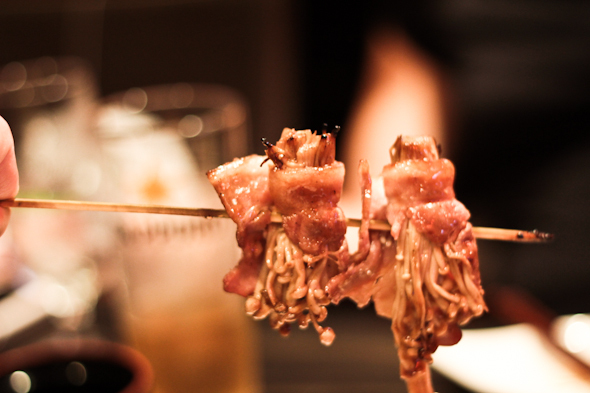 We also order the Enoki Mushroom with Bacon ($3.99) which looks a bit odd since the bacon is wrapped around the Enoki mushrooms to make it resemble an octopus. But in terms of flavour, this is simply divine. Grilled mushroom and bacon with a light layer of sweet sauce simply work well together. 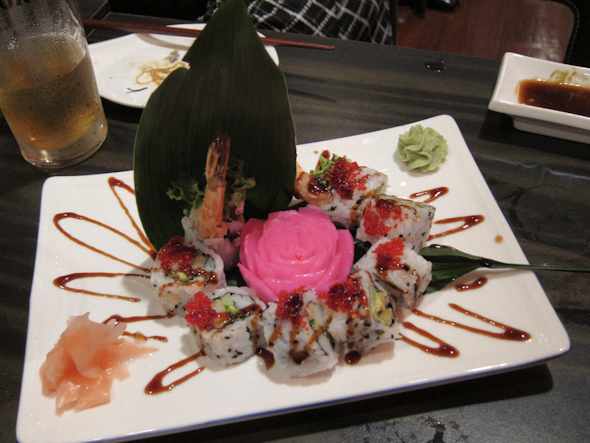 sushi, we order the Dynamite Roll ($6.99) which is deep fried shrimp, cucumber, avocado and flying fish egg rolled into large sushi rolls. Even though we are absolutely stuffed buy the time this dish arrives we manage to enjoy the roll's delicate balance of flavours. 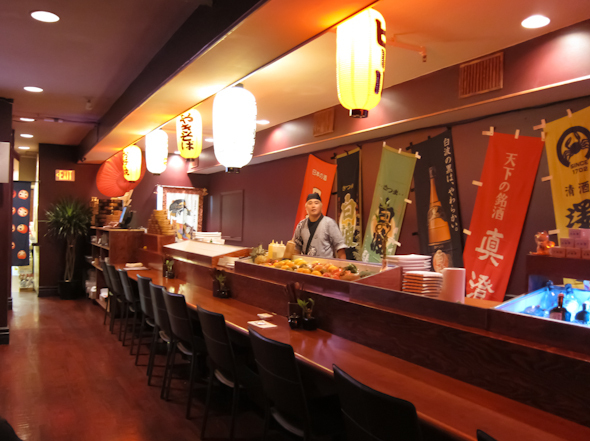 Kokoni Izakaya also offers Aburi syle sushi starting at $3.99. 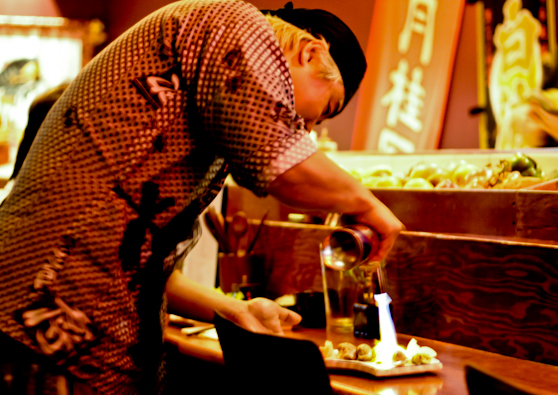 Available for prawn, uni, salmon and tenderloin sushi, the torching is done with a lot of flair and is quite a spectacle.